We all knew that Jean Claude Constantin can create amazing original puzzles, but did you know that he can also take someone else's design and turn it into something even more appealing? That's what he did to Stewart Coffin's design #167, the Cruiser. A difficult Packing Puzzle with only four pieces. Quattro Formaggi, the new version, has more character, more style. It can capture your attention right away by the originality of its design. Simply put, the new design is a whole lotta cheese. Both the frame and pieces represent the famous Swiss cheese, Emmental. 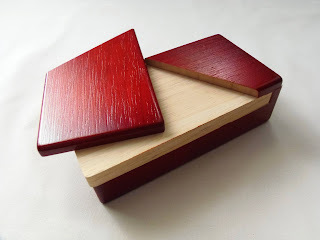 Even the wood used for the puzzle has that characteristic yellowish tone. This is also a relatively small puzzle, with dimensions of 11cm x 9.5cm (4.3" x 3.7"), with the inner frame being 8.7cm x 6cm (3.4" x 2.4"). If you solved the Cruiser before, there's really nothing new to challenge you here, unless you'd like it for collecting purposes. The concept and proportions of the puzzle are exactly the same. The difficulty is unchanged, which is quite challenging by the way, considering it's only a four-piece puzzle. Luckily for me, solving the puzzle wasn't as hard as I was expecting. It took me less than 10 minutes. That's because I had solved a similar puzzle a while ago by the name of Quadratum Cubicum, more specifically Abu Bakr Al-Khalil's design. 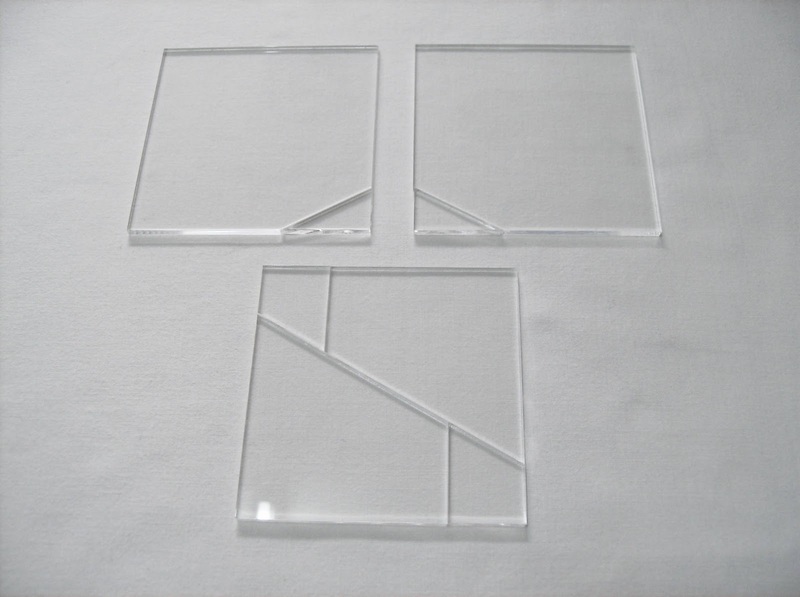 The idea is to form a perfect square with the provided fragments, or pieces. The only difference between these two puzzles is that the solution for the Quattro Formaggi doesn't involve a square, but a rectangle instead. Also, when solved, the pieces don't occupy all the rectangle's area, leaving some empty spaces (excluding the piece's circular cuts). Solution: If you need help with the solution, just take a look at the solved puzzle here. 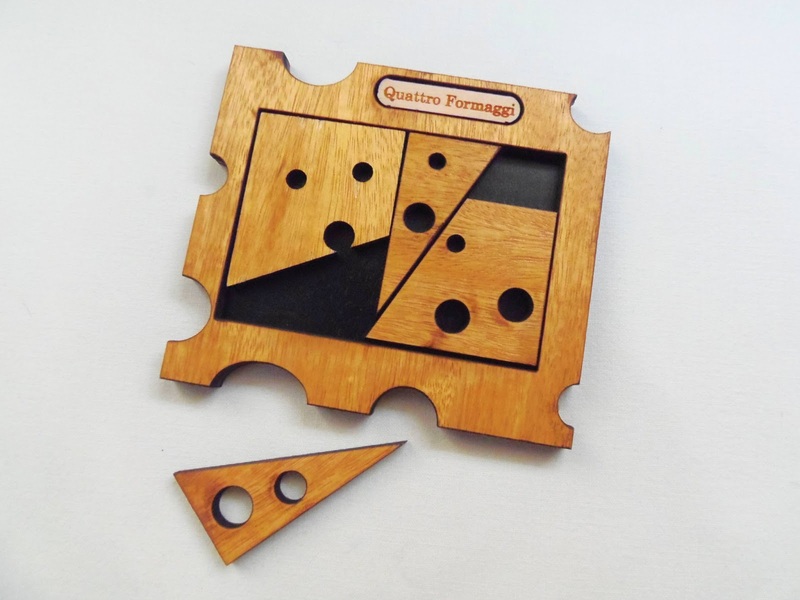 Quattro Formaggi is proof that Constantin can accomplish anything in puzzle design, even with other's creations. I never tried Coffin's original design, but from what I've experienced with Constantin's version, the puzzle concept in itself is a superb puzzle. If you like Packing Puzzles, you should give this one a try. Availability: You can get a copy of Constantin's Quattro Formaggi at Sloyd. Since the Rubik's Cube was introduced worldwide, back in 1980, we've seen countless variations, some better than others. Uwe Meffert, who's known for his popular Twisty Puzzles, launched in 2011 a very interesting version of the 3x3x3 cube we all know and love, the Wellness Ball. In essence, the Wellness Ball is a Rubik's Cube with an extreme makeover. The core is the same 6-axis "spider" (see video of its internal mechanism), but pretty much everything else is different. 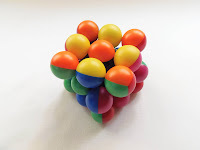 For one, instead of a classic cubic shape, the Wellness Ball features 27 spheres and sports a new color scheme (orange opposite yellow, blue opposite green and red opposite pink). Also, no stickers are used, since the spheres are made from combinations of two and three colored plastic pieces. I always prefer non-sticker variations. The Wellness Ball is slightly bigger than a standard cube, but not by much. The maneuvering of the cube feels nice and smooth, although for someone used to cubic-shaped puzzles it seems odd at first. While the movement of the puzzle is most of the time problem-free and turns nicely, speedcubing is not recommended. Meffert calls this puzzle the Wellness Ball, because it's said that the sphere-shaped cubies help to stimulate the 70.000 nerve ends in our palms and increase circulation. Whether or not it's true, I don't care. I just love to play with it. 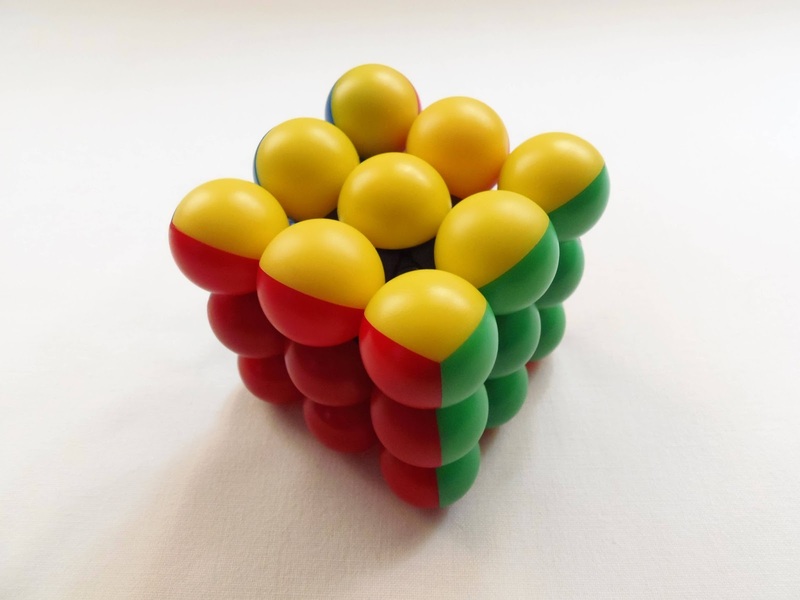 In terms of difficulty, the Wellness Ball is no different from a Rubik's Cube. If you know how to solve one, you will most certainly have no problems solving this newer variation, albeit a bit slower than you current 3x3x3 best time. 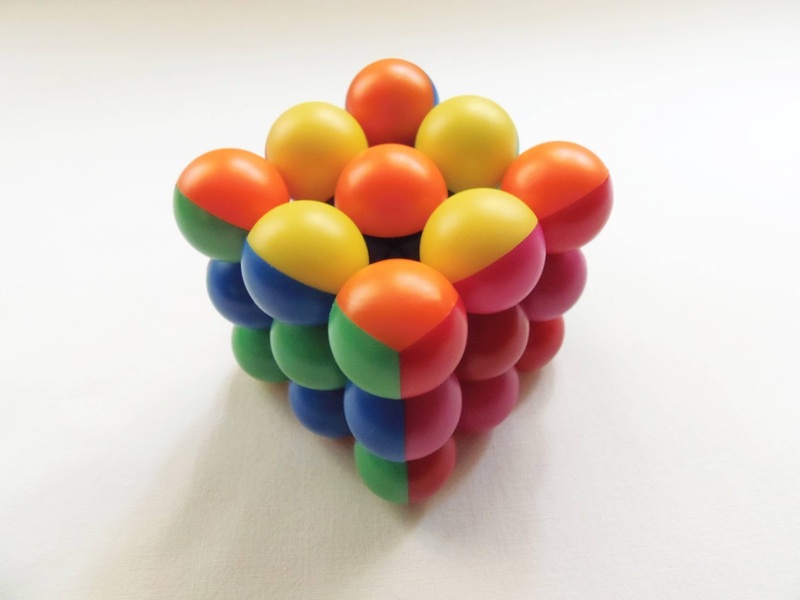 Whether you end up buying the this puzzle to stimulate the nerves in your palms, to just play with it, or to simply add it to your collection, the Wellness Ball is a welcome addition to the ever growing Twisty Puzzle family. Availability: I received the Wellness Ball from PuzzleMaster, which is available for $16 CAD. There's also a white body version, if you prefer. Check out other Meffert's puzzles from PuzleMaster. How many different concepts can a puzzle designer come up with? - Apparently, not even Jean Claude Constantin himself could answer that question, since he's one of the most prolific puzzle inventors and manufacturers I know of. He doesn't seem to run out of ideas and most of the puzzles I own from him are completely different from the other in every way. There are two versions of this puzzle, the one you see here in wood made by Constantin, and another one in aluminum manufactured by Eureka, which for reference is about twice the price. 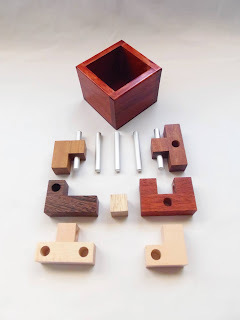 Honestly, although the aluminum one looks shinier, I very much prefer wood for my puzzles - You can't replace the feeling of open your puzzle cabinet and have that pleasant wood smell. The wooden version has about 11.5cm (4.5") in diameter. I'm not certain if the aluminum version has the same dimensions, but they shouldn't be that different. The mechanism is quite ingenious and a little tricky to understand at first. All you can see and feel is the block moving freely inside the inner edges of the frame. A more thorough inspection, however, reveals a couple of details you may have failed to notice the first time you picked it up. One of them is the difference in thickness of the block's tips, while the other is only perceptible if you slide your finger under the inner edges. Even after you have noticed those details on the puzzle, it's still far from being solved. There's a couple more things you have to do in order to free the block, but I'll leave those for you to discover yourself. The difficulty is not that high, though. It is rated as a level 2/4, which is average, but solving time can vary greatly on how well you're used to this type of puzzles. It took me about 10 minutes to free the block, but I removed it without really knowing what was going on inside. Took me another few minutes to put it back, and only after a couple more tries I was able to fully understand its inner workings. 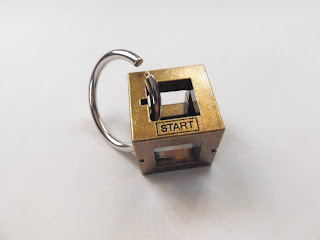 Availability: The Prison Block puzzle is available at Sloyd for just €15. 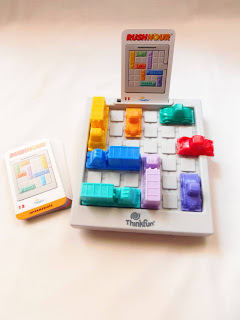 If you're an avid puzzle collector like me or remotely interested in logic puzzle games, you've probably come across Rush Hour by ThinkFun one time or another. 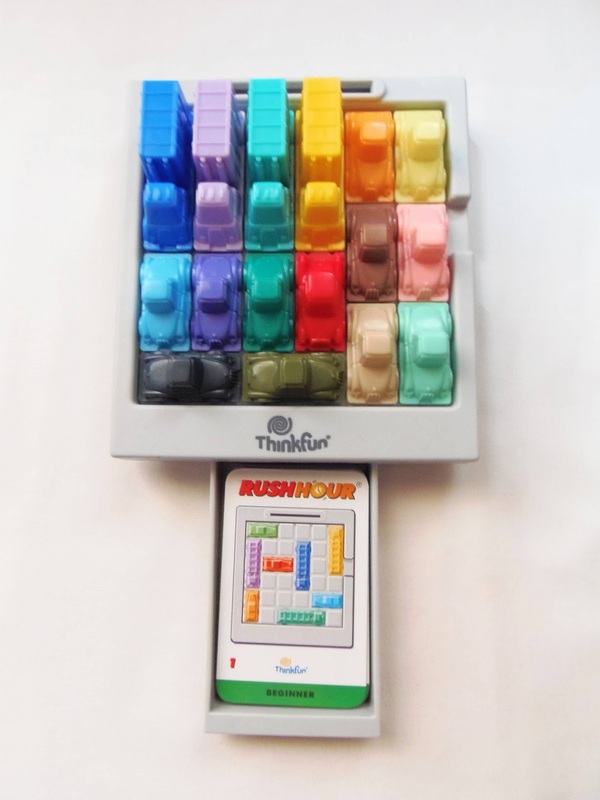 Launched in 1996, Rush Hour took a long ride before reaching today's recognizable design, since Nob Yoshigahara's Tokyo Parking puzzle. You can read more details about the game's creation here, and more about its inventor here. Rush Hour has something special about it that draws you in and keeps getting more and more addictive as you play. It's because of Rush Hour that I have today in my collection more than a dozen different logic games from ThinkFun and other brands. The goal of this game is very easy to understand, although some of the later challenges can be a little frustrating. The included 40 challenge cards are grouped in different levels of difficulty, though, so you have this real feeling of progression. There are 16 colored vehicles (4 trucks and 12 cars). The bright red one is your car, which you should get out of the traffic jam. You start by setting up the cars as shown in the chosen challenge card. 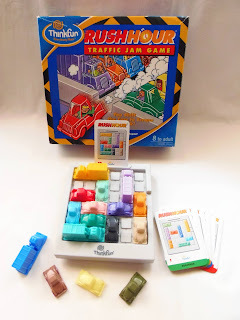 When you're done, you have to slide the cars back and forth in their direction of movement and make way for the red car to slide out the opening in the grid. One of the only rules you should always follow is that you can't lift up the cars when you're trying to solve a challenge. Sliding is the only way out. The game is now so popular that ThinkFun has launched additional packs, each including 40 extra challenges and a new car, and even different versions, like the Rush Hour Jr. or the Safari Rush Hour. 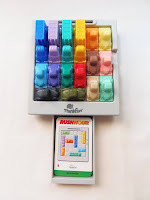 If you're a gadget geek, there's also something for you, like the Rush Hour App with a whopping 2500 challenges. Rush Hour has sold millions of copies since 1996, so I'm not saying nothing new by recommending you this superb puzzle game. It's suited for all ages (8 to adult) and the different levels of difficulty make it accessible for everyone to play it. When you get into this type of logic puzzle games, there's a whole world of them waiting to be discovered. Availability: My copy of Rush Hour came from Sloyd in Finland and it's available from about €20. I'm not sure why, but I love puzzles with German words - Sounds cool and difficult. Jean Claude Constantin, a German puzzle designer, has named a lot of his inventions with German words and expressions. 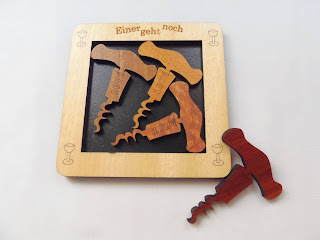 For example, today's puzzle, with a wine theme, is called "Einer Geht Noch" and could be translated as "one more?" or "let's have another", or something along these lines. Like most Constantin's puzzles the design is visually stunning. With a lighter tone wooden frame and contrasting darker tones for the pieces, everything about this puzzle looks harmonious and balanced. The frame is perfectly squared and measures 12.8cm (about 5") in diameter, with an inside area of 9.3cm (3.7"). Einer Geht Noch consists of four identical pieces in the shape of a corkscrew that need to be packed inside the frame. 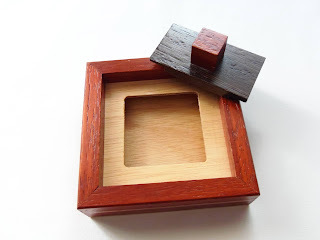 The irregular shape of the pieces make this simple task a tough challenge, since they won't occupy all the frame's space. Each piece is marked with a number, supposedly a date, to denote the front and back of the pieces. When solved, the pieces must be facing upwards (showing the numbers), not a mix of front and back, and have very little wiggle room for moving around. As mentioned above, the difficulty of the puzzle is quite challenging. PuzzleMaster has a rating of 8/10 (Demanding) for its level of difficulty. I reckon it's a fair rating, since most people will have a hard time solving it. I have played and reviewed several puzzles like this, and because of that I've solved it in a reasonable amount of time, in about 10 minutes. The solution is a bit counter-intuitive, but not as much as other similar puzzles. I think the small number of pieces helps to bring down the level of complexity, compared to other puzzles with much more pieces. There's only so much you can do with four pieces and with a little patience and persistence anyone can solve this. Solution: There's no solution provided or on the site, but you can take a look at the solved puzzle here. Don't click if you want to solve it by yourself. Einer Geht Noch is yet another great puzzle by Constantin. Superb design and original idea. For packing puzzle fans, this is a must-have. Also, perfect as a gift for a wine lover. Availability: You can get the Einer Geht Noch at PuzzleMaster for $19 CAD. You can also check out other designs by Jean Claude Constantin. My latest reviews for Sloyd's puzzles led me to the conclusion that this store is the ultimate one-stop shop for the most difficult puzzles you will ever encounter. My latest fiend is Vesa Timonen's High H. In fact, this has little to do with "latest", as I got this puzzle almost a year now, and I've been saving it all this time, waiting to be able to solve it, to write its review. High H is like your typical puzzle, where you're given a set amount of pieces and you have to build a simple and recognizable shape from all of them. 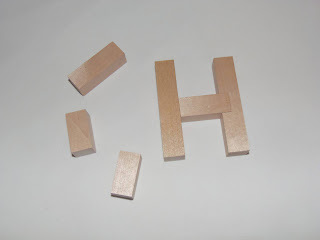 In this case, the shape you're asked to build is the capital H (not so simple as the one in the picture above) and to do so you have at your disposal only 5 pieces. Two of these pieces are identical and the rest have different lengths and shapes. The most intriguing is the T-shaped piece, and definitely the most deceiving, for obvious reasons. There's no fancy design or anything like that. Just pure puzzle genius... Or madness, depending on your level of patience after (if) you solve it. The material is Sloyd's characteristic Finnish birch wood, and in terms of dimensions the lengthiest pieces measure 8.6 x 1.7cm (about 3.4" x 0.7"). So, what makes this puzzle so damn difficult? - It's hard to explain, but my theory is, what the designer makes you think to take you away as far from the real solution as possible... And there's some evidence that points to that conclusion: The vague explanation - "Make the letter H from the five pieces"; The T-shaped piece itself. All of this to make your task one hell of a challenge. Another question you may be asking is "how did you solve the puzzle"? - First, this may be the biggest "a-ha moment" I have ever experienced with a puzzle. Second, I solved it almost by accident by leaving a couple of pieces, apparently in the right position, for a while and when I returned I looked at the puzzle in a different angle. I placed the rest of the pieces and to my surprise I had the exact shape seen in the package. Obviously, I won't reveal much of the solution, because this is one of those puzzles you want to discover it for yourself. Vesa is a master of illusion and the High H, in my opinion, may be one of his masterpieces. This is coming from someone who has reviewed several of his designs, but this one is borderline genius. You must experience this puzzle. Availability: Sloyd.fi in Finland is the place to get this amazing puzzle. For just €7.06, this is great value for money, as you probably won't solved it right away. 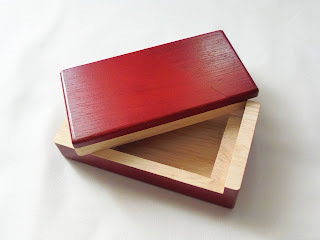 Have you ever played with an Elastic Cube? - If your answer is yes, then you'll certainly enjoy the Snake Pool, one of my most recent acquisitions from Brilliant Puzzles. 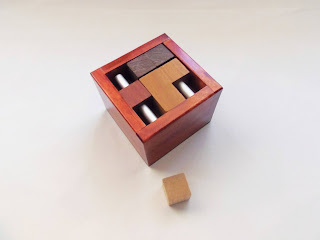 The Snake Pool uses the same principle of other several puzzles by having a contiguous group of cubes, attached by a string, that you need to rearrange in order to form a desired pattern. The pattern, in this case, is to be able to get all eleven cubes inside the provided frame. 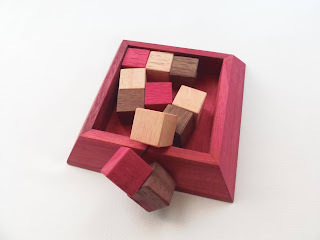 It's a bit challenging, and requires some dexterity to keep the already packed cubes from moving while you're attempting to move the others into place. 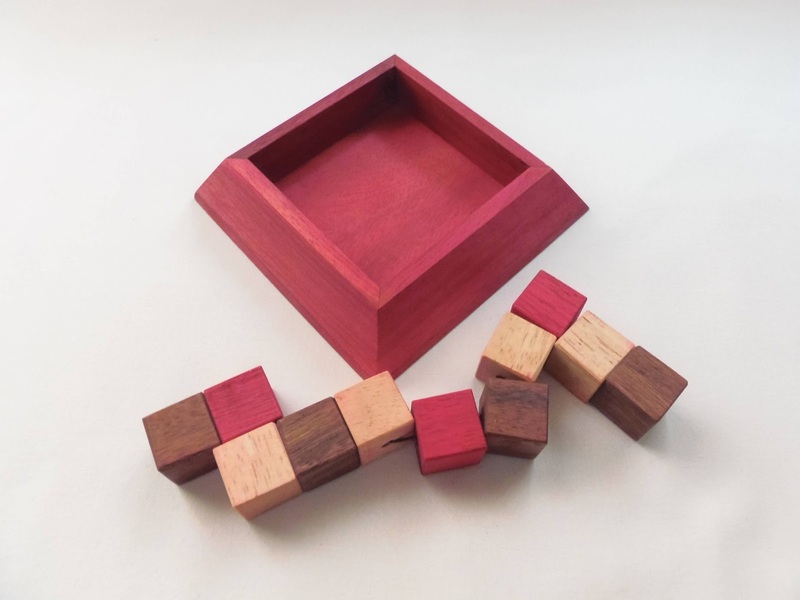 The design draws attention for its bright colors, especially the red, which is used in the frame and some of the cubes. 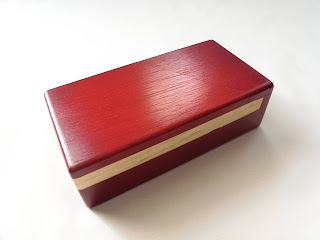 The color is painted into the wood, which in my opinion is a bad choice, because the other cubes are smudged with red. This'll only get worse with more usage, unless you're planning to get it for collecting purposes only. Other than the color, the puzzle is very well crafted and the concept is really interesting. The puzzle comes already packaged in its solved state, so if don't like spoilers ask someone to get it out of the frame for you. It's not a big deal if you see the actual solution, because the puzzle has a few possible ones. This way, you can always go for a different challenge. There are no specific rules to solve the puzzle other than getting all cubes to fit flat inside the frame. However, common sense says that there shouldn't be any string visible from the top. The string is flexible, but don't force it too much if you feel it's getting stretched beyond it's normal state. It's only a sign telling you that that's probably not the proper way to pack it. Solving it took about 10 minutes. Again, it's a bit challenging at first, because it's not easy to maintain the cubes in a stationary position while you're moving the rest of them, but besides that it's relatively easy. This is rated as a difficulty level 4/5, but for me it was more like a level 3. It really depends on how well you do at packing puzzles. Solution: Click here to see one of the possible solutions. The Snake Pool is an enjoyable and fun puzzle to solve. The color smudge problem might be a turn off for some collectors, but if you're not picky with this kind of things, go for it. I'd rather have bland colors and a perfect-looking puzzle, but it was still worth a look. Availability: The Snake Pool puzzle is available at Brilliant Puzzles for just $10.95 USD. Cast Box is one of the most recent Hanayama puzzles, released at the end of 2012. This is Yuta Akira's first contribution to the Cast Series, and I might add a great addition. The puzzle made its first appearance at the 2011 IPP Design Competition, then known as "Simple Solid Ring Maze" and also with a wooden frame. Understandably, Hanayama later changed its name to a simpler version, the Cast Box. I must confess, the first time I saw this puzzle I immediately thought of Oskar van Deventer and his Cast O'Gear. The concepts of the two puzzles are not that different, since you have to find the best route to free the gear, and in the Box's case the ring. The box has these grooves on its edges that let the ring pass when aligned with the pin found at the ring's opening. Once you free the ring, you have to put it back in the "Start" position. The design of the Cast Box is visually appealing and feels heavy (comfortable) in your hands. The box itself has the usual Hanayama treatment, which makes the metal appear more aged. The cage is relatively small with a diameter of 3.6cm (1.4"), while the ring is slightly bigger with a 5cm (2") diameter. The goal is simple to understand and it should be simple enough to solve, as this is just a difficulty level 2/6, but for some reason I spent more time to solve it than I was expecting for this kind of puzzle. After almost half an hour trying to get the ring out, I understood why I took so long to free it. 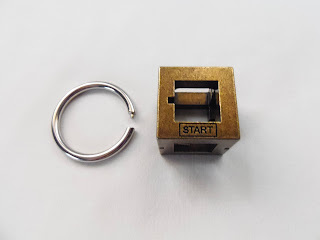 You could spend hours with this puzzle having the ring return to its original position over and over again, until you change the way you look at how the ring moves around the frame. If you keep making the same movement of passing through just one of the box's edges, you won't get far. Skip ahead of this paragraph if you don't want any hints on how to solve it. The trick is to get the ring to a position where you have two of the box's edges inside the ring, not just one. After this, the puzzle is all but solved. Getting it to to the start position was easier and less time consuming, although I didn't do it at my first try, because I started at the wrong edge of the box. Just remember the position where the ring is free and you'll do fine. Solution: Click here to download a .pdf with the solution, or here for a video solution. The Cast Box is your typical Cast Puzzle. Just by looking at it you'll associate it with Hanayama right away. It's a nice puzzle to start with the series, because it's easy to understand, yet offering a good amount of challenge. Availability: I got the Cast Box from PuzzleMaster in Canada. For other in the series, check out their Cast Puzzle section. Jean Claude Constantin not only has great looking puzzles, but also quite a few fiendish ones. Last week, I reviewed his IQ9, which remains unsolved even after a hint from Tomas Lindén, and this week I have to add to the unsolved family the Pack+1. Well, it's half solved, so to speak... I'll explain further below. The puzzle is beautifully crafted with various tones of wood for the pieces and a reddish tone for the box. 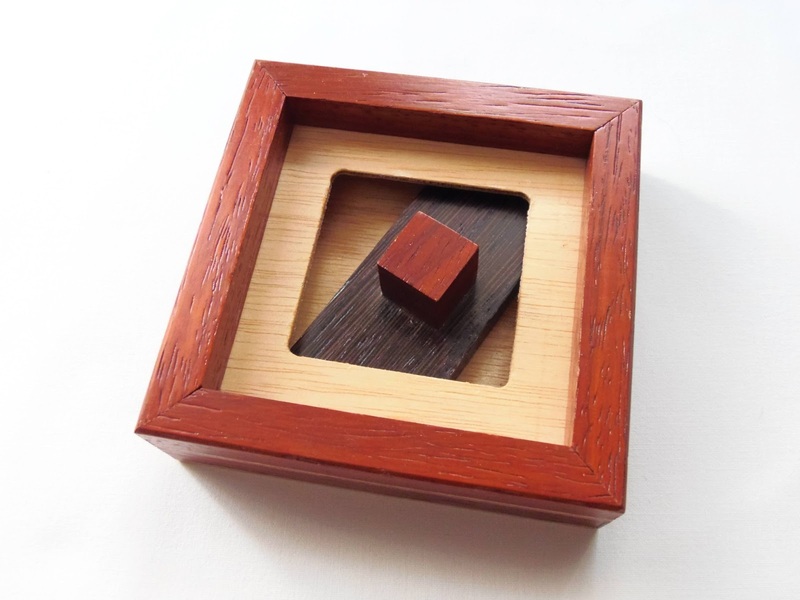 There's a nice contrast between wood and metal that complements the overall elegant appearance of the puzzle. The dimensions are medium sized, with 8 x 8 x 6cm (3.2" x 2.4"). Pack+1 consists of seven wooden pieces and five metal rods, two of them are glued to two pieces and the remaining three are loose. 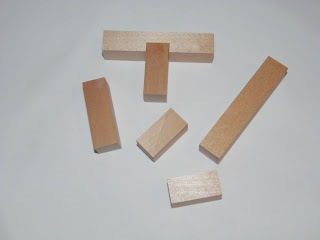 Most of the pieces have at least one hole across their sections, except for two of them, and the second one is the extra piece (the one-unit block). There are mainly two challenges for the Pack+1: the first challenge, although easier than the second, it's still a bit hard to solve and involves packing all the pieces and rods into the box, except for the one-unit block. When you accomplish this goal, the second challenge asks you to pack all the pieces again, this time with the addition of the extra piece. This is exponentially harder to solve, which explains why I haven't solved it yet. It's been a good couple of weeks for the mind boggling puzzles. First the IQ9 and now the Pack+1. Constantin really knows how to make them. Solve it or not, the Pack+1 is a great looking puzzle and deserves a place in your collection. Availability: Pack+1 is available at Sloyd.fi for about €25. If you want a bigger version, you can opt for the Pack+1 Stor instead.